After long months of preparation, Allied troops, made up of American, Canadian, British, French, Australian and South African units, landed in the night of July 9 to 10. The 1st Canadian Infantry Division and the 1st Canadian Army Tank Brigade were under the command of Major-General Guy Simonds. Canadian troops fought in difficult conditions, dealing with very hilly terrain and temperatures of over 40 degrees Celsius. 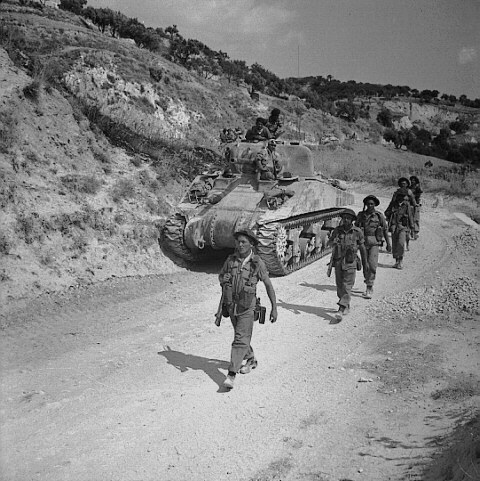 From their landing point on the Sicilian beaches near Pachino, Canadian troops advanced toward the interior of the island, taking part in the battles at Grammichele, Piazza Armerina and Valguarnera. The towns of Leonforte and Assoro, situated in good strategic positions at the top of hills, put up a strong defence, but the Canadians prevailed in the end. A total of 562 Canadian soldiers lost their lives during this campaign. The Sicily landing opened the way for the Allies to launch the Italian campaign a few weeks later. Library and Archives Canada holds a large collection of military documents relating to Operation Husky and the Sicilian Campaign. Other examples can be accessed via the links below. To view more photos, please visit our Flickr album. This entry was posted in Military Heritage, Our Collection and Facilities and tagged 1943, Flickr, Operation Husky, Second World War, Sicilian Campaign by Library and Archives Canada Blog. Bookmark the permalink.